FILE - U.S. President Donald Trump speaks at the Great Hall of the People in Beijing, China, Nov. 9, 2017. U.S. President Donald Trump said Thursday he did not plan to meet with Chinese President Xi Jinping before a March 1 deadline set by the two countries to achieve a trade deal. FILE - U.S. President Donald Trump listens as he meets with China's Vice Premier Liu He in the Oval Office of the White House in Washington, Jan. 31, 2019. A person briefed on the talks said that Trump's advisers were concerned that accepting a meeting invitation at this stage would raise unfounded expectations for a quick deal and erode U.S. leverage in the talks, where the two sides remain far apart on core structural intellectual property issues. "There was concern about the downside for markets in particular if they don't reach a deal," the source said. 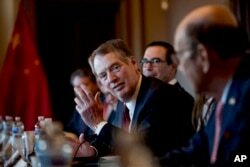 FILE - U.S. Trade Representative Robert Lighthizer, accompanied by Trump administration officials, speaks during a meeting with Chinese Vice Premier Liu He and other Chinese officials on the White House Complex, Jan. 30, 2019. "They're hoping for more success," he said. 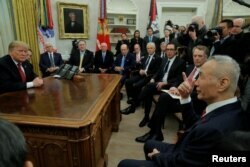 Trump said in his State of the Union address Tuesday that any new trade deal with Beijing "must include real, structural change to end unfair trade practices." "If we do make headway, and the president thinks we're close enough that he can close the deal on major issues, then I think he'll want to have a meeting and do that," he told reporters. "I have complete confidence in the president, both to close a deal if we get to that point, but also to make that judgment."